Well, the people have spoken and it looks like I'll be breaking out of my comfort zone and NOT knitting myself another blue sweater... instead I'll be knitting my Modified Gemini in Iris! 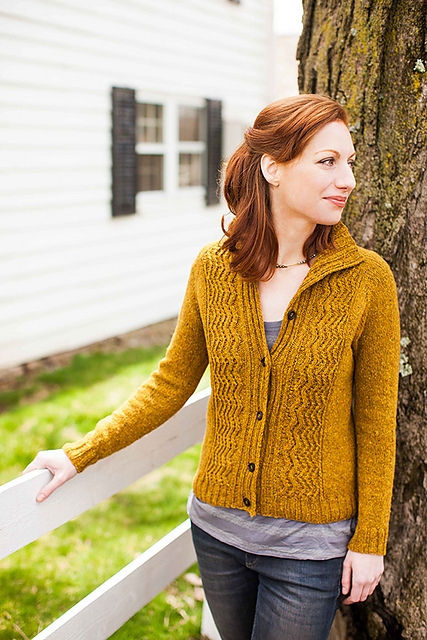 Thanks to all who cast their vote and think that Iris is a sweater-worthy colourway. I couldn't agree more. It's going to be awesome. But first, I've got another knit on the needles that I'm eager to finish. I've been squeezing in a few knitting minutes here and there and am managing to make it all add up to an almost finished wee knit. It's a new design that I'm working on and I have no idea if it will work out. I'm knitting it in Lucky Penny and it's looking good so far! I'm sure that you've all seen the super popular and super lovely Gemini Tee design by Jane Richmond published in the Spring/Summer 2012 issue of Knitty. 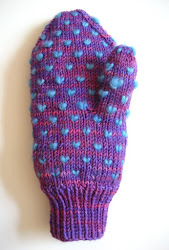 Well, this is Jane's modified version of her own pattern. 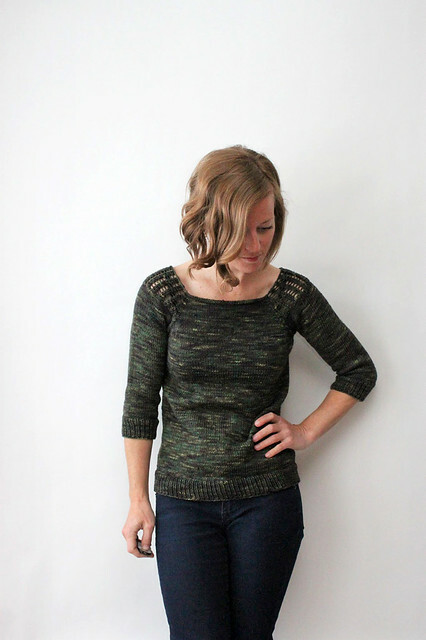 She's switched up the summery cotton yarn for TFA Yellow Label DK Weight in Olive and added 3/4 length sleeves. And I have to say, I'm crazy about her mods. As you may have noticed, I don't knit much with summery yarns, I'm a wool girl. And probably because of that I don't knit many summery knits. I've knit 1 cotton tank and I wore it maybe once or twice just out of a sense of obligation. Jane's mods are right up my alley. All the beauty of the original design, the impact is all in the yoke after all, but with the Tanis friendly 3/4 length sleeves to make it totally wool appropriate. 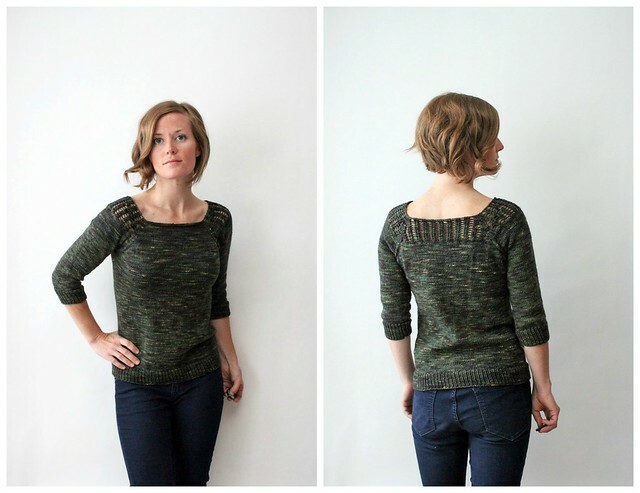 Jane has provided notes on her Ravelry project page so you too can make your very own 3/4 sleeve Modified Gemini. Great job Jane! This is now on my list of things to knit. I'm trying to narrow down my colour choices, it's a tough call. 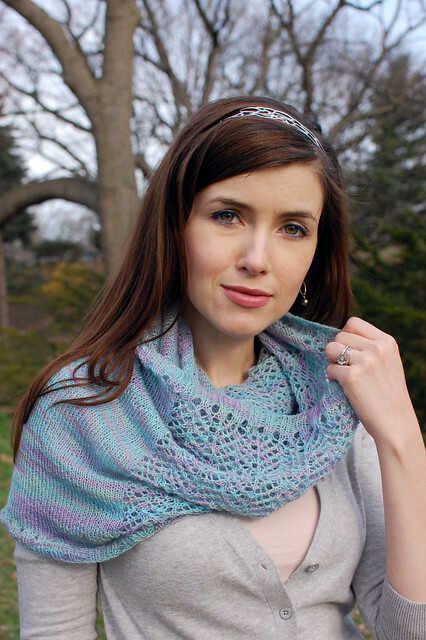 I'm considering Iris, because it's new and pretty and I just can't get enough of it. Or frogging this knit, which I intend to frog either way, and using this really pretty One Of A Kind colourway to knit my very own Modified Gemini. What do you think? 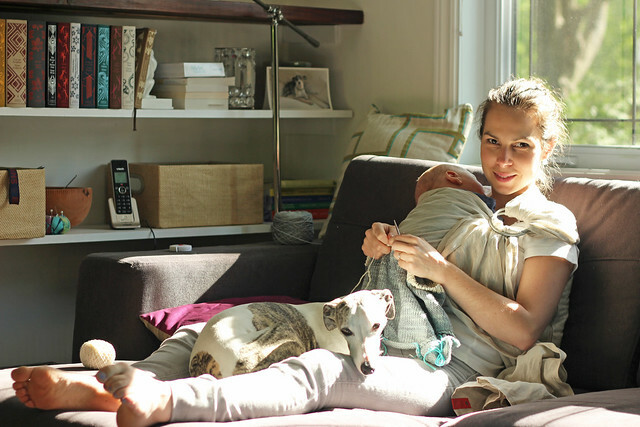 I think that every knitter who has a baby goes through what I'm going through right now. The inevitable realization that your knitting time is just not what it used to be. And it's a tough pill to swallow. 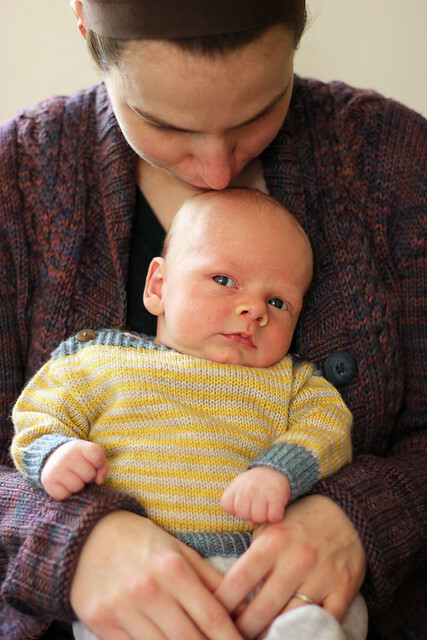 In the past seven weeks I have knit one sock, 2 sleeves and a collar, and a wee baby sweater. Not terrible progress, but certainly nowhere near what I'm used to. 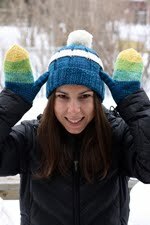 For me, I think the struggle is less about the loss of "free" time that I would have previously devoted to knitting, but more about the loss of my creative output. Knitting, designing and making things is such a huge part of who I am that without it I feel a bit lost. That sounds dramatic, I don't feel terrible or sad, I just miss having an idea and then having all the time in the world to run with it and see it through. The good news is Rowan is thriving! He is growing like a weed, smiling like the happiest little munchkin ever, and has given Chris and I so much to be grateful for that I feel silly to be missing my stitches. We're getting settled in to our new life/work schedule and I can see the day coming when I will have enough energy in the evenings to stay up after Rowan has gone to sleep and get some solid knitting time in. Until then, I'm writing down every idea that pops into my head so when my creative time comes back I'll be ready to make the most of it. Look out! 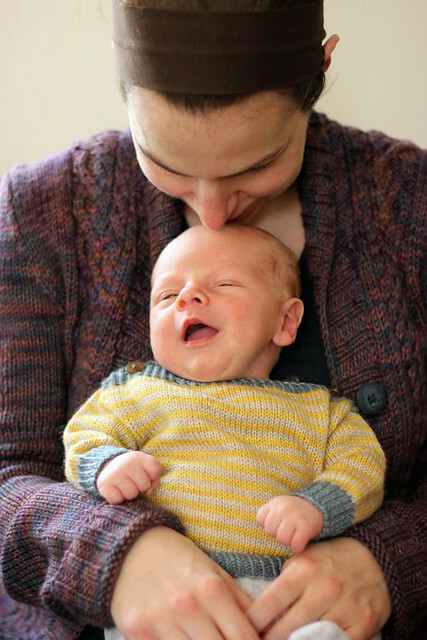 I'm glad that I stocked up on baby knits before I actually had a baby! 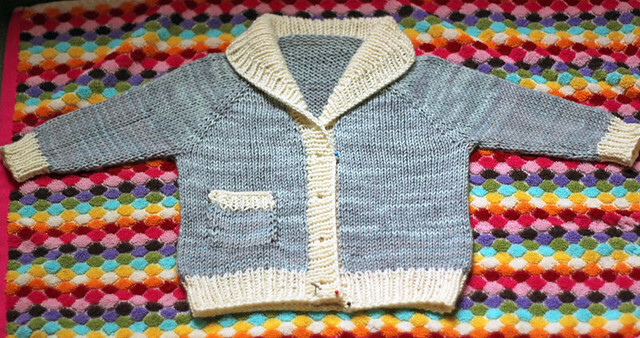 This is the only thing I've knit for my little guy in the seven weeks since he was born. Details, and maybe even modeled shots, coming soon! Can you believe that we are already half way through the 2013 Year In Colour Club! Crazy. 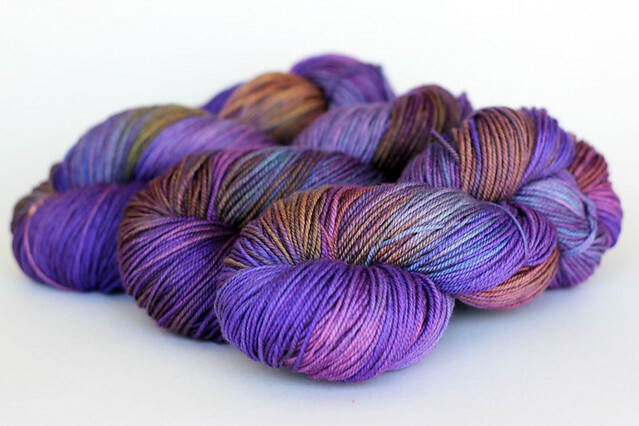 The May installment of the Club featured a skein of Pink Label Lace Weight yarn dyed up in the gorgeously soft and subtle Moonmist colourway. 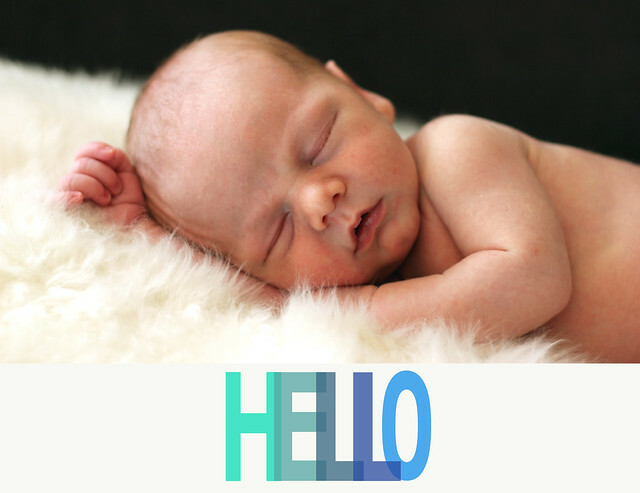 These soft shades of baby blue, lavender, pink with a bit of green are so springy. 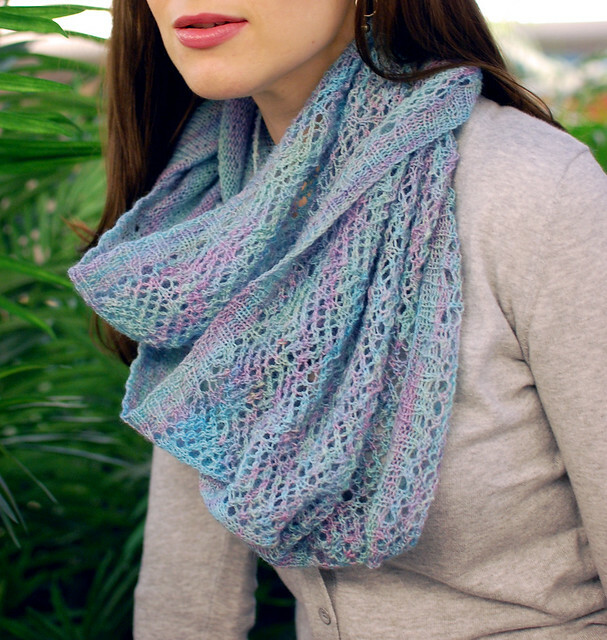 Julie designed this light as air Fairy Mist cowl to accompany this special skein. Wrapped loosely around the neck this cowl is a terrific spring accessory and a fun simple knit, perfect for this transitional time of year. 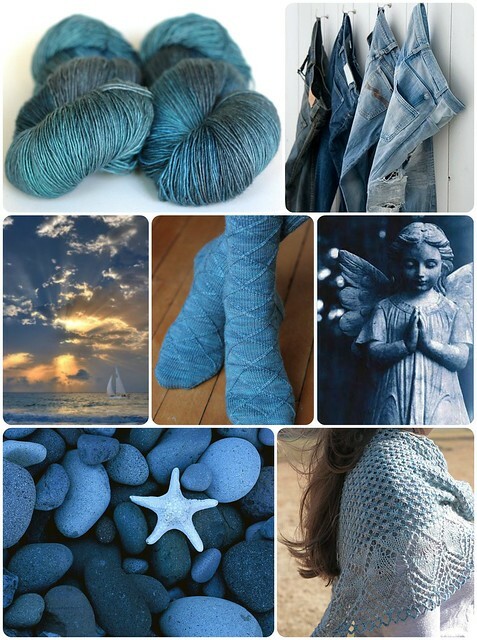 photo credits, clockwise from top left: Red Label Atlantic, jeans, angel, Adhara Shawl, rocks, sail boat, Business Casual Socks. Little boys, oceans, cool breezes, faded jeans. The perfect denim neutral. 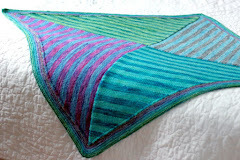 Pattern: based on Beatnik by Norah Gaughan. 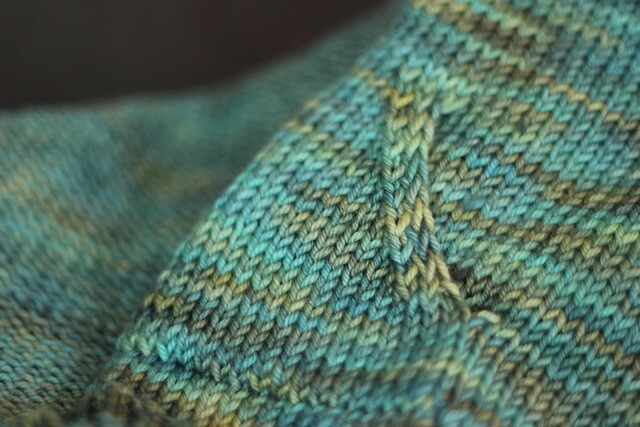 Yarn: TFA Green Label Aran Weight yarn in Seabreeze. Sweater love. There is definitely such a thing. True love between a girl and her new favourite sweater. I don't pick favourites generally, actually, that may be the complete opposite from the truth... every sweater I knit is my new favourite. Which is really a nice thing since I think that getting excited about the things that you make is important. So right now, fresh off the needles, this sweater is IT for me. It's my number one. 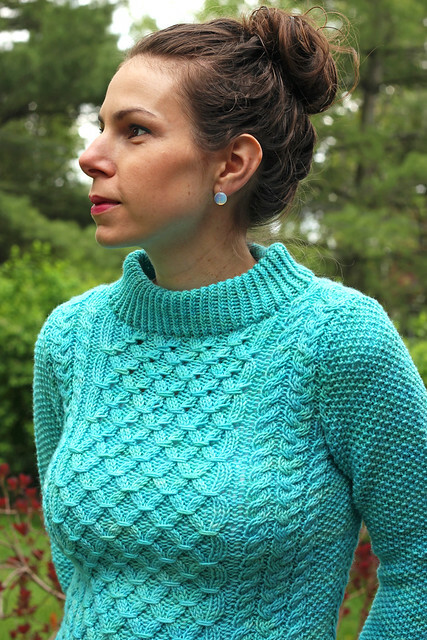 I love the texture, the cables, the seed stitch 3/4 length sleeves, the wide, high collar. All lovely. If I'm being completely honest I should admit that there were a few things that I didn't love about the knitting of this sweater. Mainly the "increase/decrease in pattern" parts. Increasing and decreasing in seed stitch was difficult to get looking really neat, and frankly I don't think that I nailed it. Along the same lines seaming seed stitch was also no fun. I love the clean, crisp lines of a perfectly mattress stitched seam, and this pattern just didn't allow for that. The seed stitch does do a very good job off hiding any little blips or flaws in seaming though, so I guess it's a problem that takes care of itself. I switched out the cables for this sweater to better suit my taste and I'm really happy with the mod. 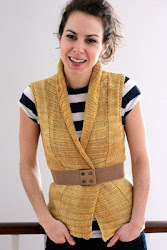 I love that smocking stitch cable and it's extremely easy to do. It has such high impact and is really stretchy, which is nice since I have a few more curves for this sweater to stretch over these days... 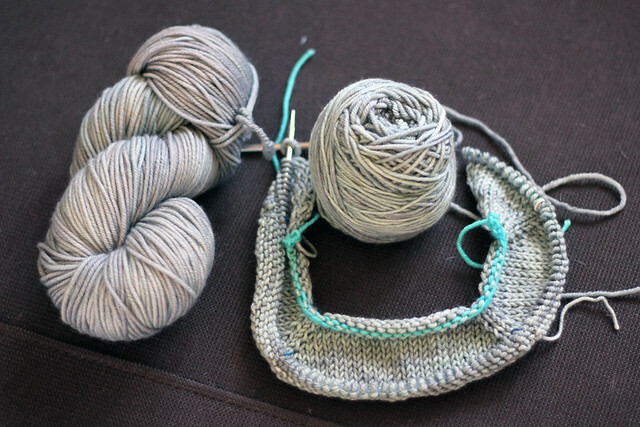 I do intend to update my Ravelry project page with the charts for the cables I chose, but that will have to wait until I have a bit more time to work them up for you. I did not modify anything other than the cables. I made sure to pick patterns that worked with the given stitch counts for the sweater, so the set in sleeves and front and back shaping remained the same. Super simple mod. Just what I needed. 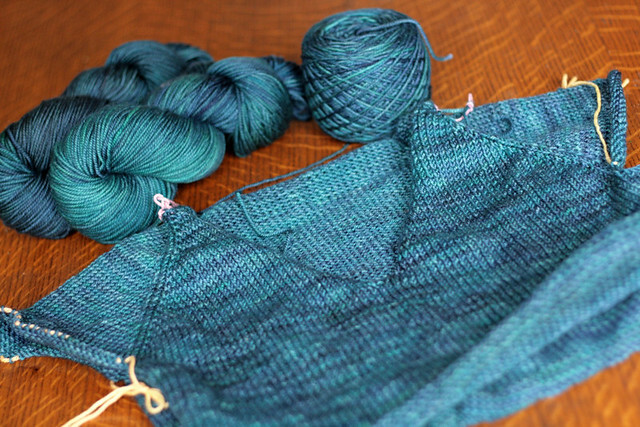 And Seabreeze, still so not over this colourway! This is my knitting nook. This is the corner of the sofa where I used to spend hours every night sitting and knitting. I have the phone within reach, there are baskets containing yarns, patterns, notions all just an arms length away. It's my happy place. Stella usually sits with me, she adds to the happy vibe. 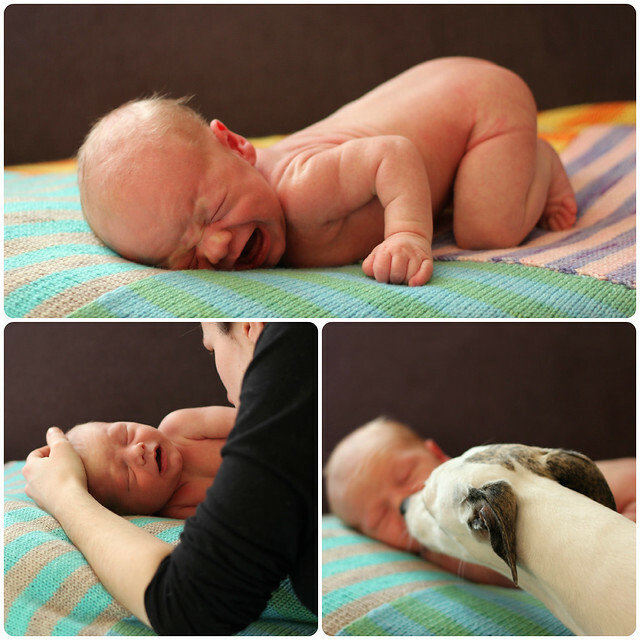 Like most babies, Rowan likes to be held and has made this preference very well known. With the addition of this awesome sling to my baby wrangling arsenal my happy place is now even better. I certainly don't get the same couple of knitting hours in every night, but a few stolen moments during the day is just heavenly. Happy Mother's Day... To ME! And all the other moms out there of course. I'm just a little bit excited to be a mom for the first time myself this year. ;) I'm a mom. What a thrill. Having a baby has made me feel so incredibly overwhelmed with love. I love Rowan more than I ever thought possible. I love Chris more than ever because he's such a natural, amazing dad and I see him every time I look into Rowan's little face. I love my parents because I now know how they felt when they had me, and I appreciate them for loving me this much. So much love! I have something very exciting to share with you all today. Last fall I was secretly working on a design and it has officially been released: Reverb for Brooklyn Tweed's Wool People 5! 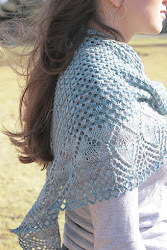 Here it is on Ravelry. Most of my design work has been self published, using my own yarns, a process which I find very rewarding. It was really neat, however, to do something different and get to work with the Brooklyn Tweed team and the beautiful Shelter yarn for this design. It forced me to branch out of my comfort zone and stretch my design muscles. I feel so lucky to have been included in this awesome publication! Of course, another real bonus was getting to see one of my own garments expertly photographed by Jared himself. His images are always so stunning, check out the beautiful gold Hayloft colourway against the models red hair. perfection! Before sending my sweater off we snapped a few photos ourselves. I was a few months pregnant in these shots, so the sweater didn't quite fit the way it was intended to. I really love the rich texture that the Shelter yarn lends to the knit fabric. 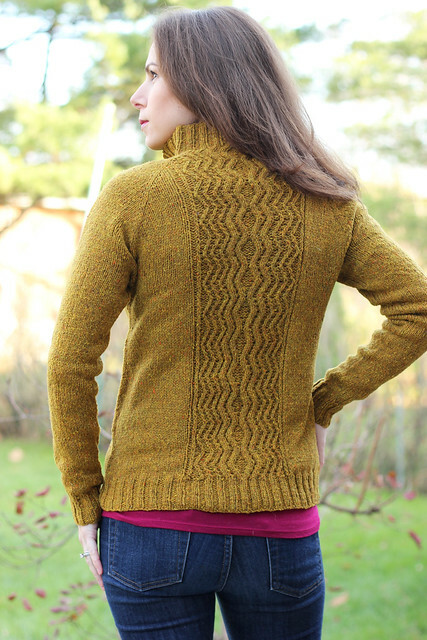 Those beautiful tweedy, heathered colourways look so great worked up in cables, they really pop! I decided to keep it crisp and clean for this sweater, a straight, linear design. I'm really happy with the finished product and will be wearing this sweater a lot in the fall. Now the big question, what colour of TFA yarn do I knit a second version in? I thought it would be fun to combine a few of my favourite things into a new occasional blog feature. I'm calling it Moodboard Monday (though it won't happen every Monday, it just has a nice ring to it.) 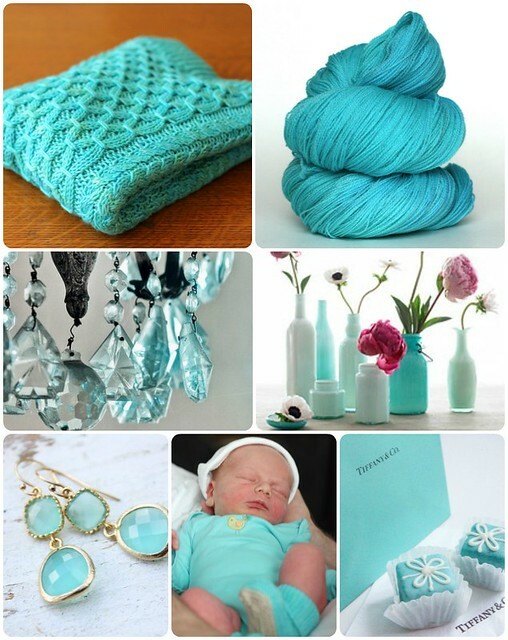 I'll pick a colour that I'm really into right now and make a lovely little moodboard to highlight it's beauty. It's all about the eye candy really. Enjoy! 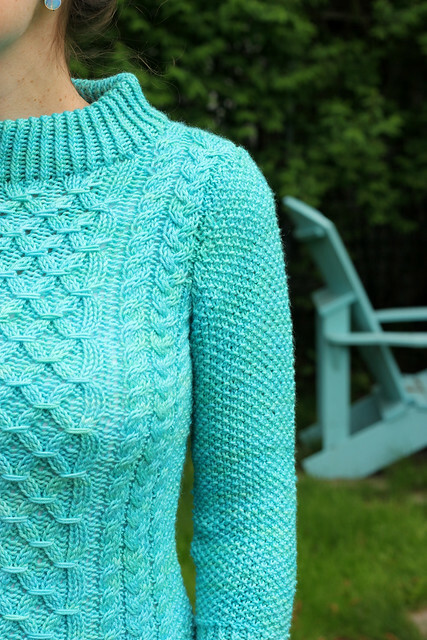 What would you knit in Seabreeze? I'm knitting a Gramps cardigan for Rowan. It's such a quick, awesome knit that last night I cast on and made it almost to the point where I was ready to divide for the sleeves when I realized that I had made a mistake and had to rip back the entire thing. The crazy thing is this is the FIFTH time that I've knit this pattern and I do believe that every single time I do I make the same mistake. The sweater is knit from the top down, you increase at the raglan markers and along the front to make a v-neck... I never remember the front increases! I can't believe it. I need to triple underline and highlight that instruction in the pattern.